Order a 1 oz Assorted Palladium bar or round today and you will receive our pick of assorted 1 troy ounce 9995+ pure palladium coming from reputable mints such as The Royal Canadian Mint, PAMP Suisse, Credit Suisse, Johnson Matthey and more. These bars, rounds and coins are suitable for buyers looking for tremendous value, variety and beauty in their collection. 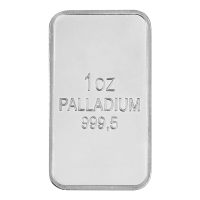 1 oz Assorted Palladium Order a 1 oz Assorted Palladium bar or round today and you will receive our pick of assorted 1 troy ounce 9995+ pure palladium coming from reputable mints such as The Royal Canadian Mint, PAMP Suisse, Credit Suisse, Johnson Matthey and more. These bars, rounds and coins are suitable for buyers looking for tremendous value, variety and beauty in their collection.